All marriages are mixed marriages. Catholics know this. It does not matter if both partners are committed Roman Catholics, were even raised in the same church, attended the same catechism classes in the same dank basement, were confirmed on the same day by the same bishop and matriculated at the same Catholic college. Among Catholic couples you may still find that one prefers this kind of Mass and one that kind, one adores the current pope and the other loathes him. One is committed to raising the children within the faith, while the other will give the children latitude to come to their own conclusions about God and the universe. And I always imagine, as a Jew, that Roman Catholics have it easy. At least they have a fixed star, in the pope and the Vatican, to ground their arguments and measure the depths of their dissent. Think of what it is like for us Jews. Let’s say you are committed to marrying within the faith, and at some point, against what feel like impossible odds, given our tiny numbers, you find a fellow Jew whom you wish to marry. That is when the negotiations begin! One of you never wants to go to synagogue, while the other would never miss it on Rosh Hashana. One of you eats only kosher food, while the other one loves a good bacon cheeseburger. Or you both keep kosher—but how kosher? One believes it is enough to refrain from work on the Sabbath, while the other refuses to drive or use electricity. One is committed to raising the children within the faith, while the other will give the children latitude to come to their own conclusions about God and the universe. For two people with any religious identity at all, there is no marriage without negotiation. This is all to say that, for two people with any religious identity at all, there is no marriage without negotiation. So actual interfaith marriages, the kind we think about when we think about intermarriage, are important because they throw into relief the problems inherent to all romantic unions. When, say, a Roman Catholic marries a Jew and together they embark on the journey of “How do we make this last for 50 years?” they are italicizing the questions that all of us who believe in long-term romantic unions ask, every day of our conjoined lives: When is a sacrifice worth making, and when is it too much? What do I really care about, and what is just my stubborn ego? Where do I end, and where does my marriage begin? And what do I owe to my religious community, which may need me as much as I need it? Jewish-Catholic intermarriages are particularly interesting because of all that our two communities have in common. In the United States, most Jews and Catholics trace their ancestry to working-class Europeans who arrived in the late 19th or early 20th centuries, seeking economic opportunity above all. Jews and many Catholics, like the Irish and Italians, were not considered truly white, until one day we all were, more or less; they can have testy, passive-aggressive relationships with clerical authority; and they are both petrified that the whole shop is about to go out of business. While we, as a nation, continue to profess belief in God at rates that are distinctly non-European, our specific denominational attachments continue to wane. According to a recent Pew survey, from 2007 to 2014, Catholic self-identification fell steeply, to 20.8 percent from 23.9 percent. Jews held steady at just under 2 percent. The survey showed an increase to 1.9 percent from 1.7 percent, which was within the margin of error and which, given the high birth rate of Orthodox Jews, probably masked a notable drop in identification among Reform, Conservative and secular Jews. But underneath those statistics are plenty of people who care deeply about their particular traditions. 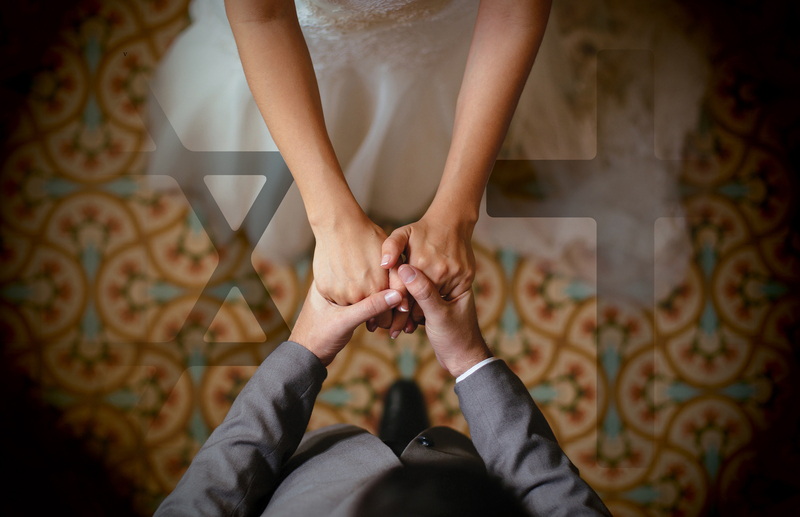 Extrapolating from the Pew statistics on Jewish intermarriage (over 70 percent among the non-Orthodox) and overall Jewish population in the United States (about 5.3 million, if one includes nonreligious, ethnic Jews), there are tens of thousands of Jewish-Catholic intermarriages in the United States. And a good number of them surely involve partners with strong commitments to their separate traditions. There are tens of thousands of Jewish-Catholic intermarriages in the United States. Partners like Michal Woll and Jon Sweeney. Woll and Sweeney married in 2010, a second marriage for each. He has two grown children from his first marriage, and they have a young daughter together, who is being raised as a Jew. Woll and Sweeney are not a typical intermarriage (as if there were such a thing). Woll, who grew up a Reform Jew in the Chicago suburbs, was a bioengineer, then a physical therapist, before becoming a rabbi in the progressive Reconstructionist tradition. She recently assumed a new pulpit at Congregation Shir Hadash in Milwaukee. Sweeney, the grandson of two evangelical Protestant pastors, attended Wheaton College, the conservative Christian school that counts Billy Graham among its alumni. After college he rejected evangelicalism and became an Episcopalian, then 20 years later a Roman Catholic. Woll and Sweeney, who in 2013 co-authored Mixed-up Love: Relationships, Family, and Religious Identity in the 21st Century, are thus seekers, finely attuned to the evolution of religious commitments. From the beginning, Sweeney found his parents’ evangelicalism confining. Still, he had the goal of being a preacher, like his grandfathers before him. After his freshman year at the fundamentalist Moody Bible Institute, Sweeney spent the summer doing missionary work in the Philippines. Sitting in these Filipino-Catholic houses, trying to de-Catholicize the inhabitants, Sweeney was intrigued by iconography all around him. “I would look at all their Catholic stuff, and I was very interested, like in their home altars and their pictures of saints,” he said, when I met him and Woll in the comfy, New England-y Vermont house they were about to vacate for Milwaukee. But in terms of becoming a Catholic, it was not in the cards, not just yet. Like her husband, Woll has a long history crossing denominational lines, albeit within Judaism. She grew up attending a Reform temple, but did not attend Hebrew school. Then at 12, she requested a bat mitzvah ceremony. Her parents said yes, and she had a lot of catching up to do. “So I went to Jewish overnight camp,” she said, “and did a crash course in Hebrew and caught up with my friends and started going to [Hebrew] school three days a week.” Still, Judaism remained primarily cultural and artistic. Years later, after Northwestern and then graduate school at M.I.T., she was living in Delaware, working for the company that makes Gore-Tex products. At the local congregation she attended, Woll encountered Jewish Renewal, a left-leaning, hippie-ish strand of Judaism that emphasizes personal piety and mystical experience. In the summer of 1995, she attended a conference where she heard Zalman Schachter-Shalomi, Renewal’s founding rabbi. “And he said, ‘The world is an economic mess because money doesn’t rest on Shabbos’”(the Sabbath), Woll recalled. That insight changed Woll’s relationship to Judaism, giving a beloved cultural practice a sense of calling. When she left Delaware for a physical therapy career in Flagstaff, Ariz., she became a lay leader of the synagogue there. “I slowly spent all of my spare time doing Jewish stuff,” Woll said. In 2001 her spare-time hobbies became her full-time vocation, and she started at Reconstructionist Rabbinical College, outside Philadelphia. In 2007 she moved to Vermont to work at her first congregation, where she met Jon Sweeney. As a Reconstructionist, Woll belongs to the stream of Judaism most comfortable with intermarriage; as a rabbi, she has never had a problem performing marriages between Jews and non-Jews. But it is still unusual for a rabbi to share her life, and the responsibilities of parenting, with a Catholic husband. When I asked if there have been any religious tensions, Woll mentioned the day she realized she could no longer attend church with Sweeney, which she had done on occasion. “I think when I finally realized that I simply couldn’t go to church at all, there was some sadness in that,” Woll said. She had hoped, early in their marriage, that she could share an experience that was so meaningful to him, if not as a worshiper then as a kind of fellow traveler. “I remember the first time I went to church with him, and I really got it, like, I got him in church, I understood the power of the ritual, I knew something happened to him in the process of going and taking Communion.” But eventually she realized that his tradition excluded her, in a way that hers, preceding his and being incorporated by his, did not exclude him. One day she just walked out. “I’m actually paying attention,” she said. Sweeney admires that Woll takes religion seriously enough to have been uncomfortable. But one also gets the sense that he admires her for the ways in which she is like him. That is, they get each other. Both are seekers, who have found their way, circuitously, to a tradition that gives them meaning. Neither of them is a scriptural literalist—when asked if he believed Catholicism was true, Sweeney said, “It’s not a category that I really use.” They are both ritual junkies, who think of all rituals, their own and each other’s, in instrumental, rather than metaphysical, terms: “There’s a way in which I don’t feel like his going to Mass is very different than me going to yoga class,” Woll said. She may be slightly underestimating what Mass means to her husband, who told me that “she knows that there are times when Mass brings [him] to tears.” But overall, he said, “her comparison makes a good deal of sense: Mass as a sort of exercising and stretching of the soul.” They tend to see eye to eye on the big things, so when they quarrel, it’s more that they quibble: he doesn’t like the Friday-night Kiddush prayer, and when they were first courting, she wasn’t comfortable with the crosses that hung on his apartment wall. Woll is the rabbi, Sweeney is the religious-books editor, who now works for Ave Maria Press, a Catholic publisher. But their religion is, in each case, more experiential, and mystical, than theological. This presents its own problems, but saves them others. Rusty and Juliana Reno are a different kind of interfaith couple: believers in a conventional God, they are both intensely theological, in love with abstruse argumentation, less mystics than big old nerds. But like the Woll/Sweeneys, the Renos have both been transformed, religiously as well as personally, by their interfaith romance. Rusty and Juliana Reno have never agreed on religious or political truth, but they agree on certain fundamentals, like what sorts of things matter. R. R. Reno, known as Rusty, is now editor of First Things, the conservative Christian political journal; for many years he taught Christian ethics at Creighton University in Nebraska. He met Juliana when he was a graduate student at Yale, teaching a discussion section of a lecture class in Christian ethics. The two Renos have never agreed on religious or political truth, but they agree on certain fundamentals, like what sorts of things matter. For example, they both wanted a religious wedding, one that obeyed the precepts of one tradition or the other. When they could not find a rabbi to marry them, they went to his Episcopal church and used the service in the Book of Common Prayer—although they added the traditional Jewish Seven Blessings at the end, which his priest agreed did not invalidate the Christian ceremony. And they agreed that one could not coherently raise a child “in both traditions.” She insisted that their children—they have a daughter and a son, now grown—would be raised as Jews. He agreed in principle, but with a caveat. “He said, ‘Look, I go to services every Sunday; you never go’ to synagogue,” Juliana Reno told me when we met recently at her law office in Midtown Manhattan. “‘Not that I am blaming you, but if that doesn’t change by the time we have kids, I am not going to be that supportive. But I have no inherent objection.’” He would have Jewish children, but they had to be raised with a Judaism that was more than occasional, and full-hearted, not half. I had questions. So many questions. How did they make it work? Politically, religiously, as parents? And the children: “He did think his witness would have more of a potent impact on both me and the children…. When he started teaching at Creighton, and the kids got past a certain age, I said, ‘This isn’t good—you think about Christianity all day every day, and I am only doing Judaism once a week, so I need to do Judaism every day so it doesn’t go away just by attrition.” So they started keeping kosher, mostly—no pork, no shellfish. Two sets of dishes. In 2003, when Rusty Reno was considering converting to Catholicism, his wife’s first response was to joke about it. “I said, ‘Honey, all those times we talked about converting, I meant Judaism!’” But her second response was to give him spiritual counsel. “I made my crack, then said, ‘Okay, honey, you need to find a spiritual advisor, and pray on this for a year.’” He did, and in 2004 he was received into the Catholic Church. Reno’s essay is an argument, although he never quite says so, for intermarriage. In his reading, marrying a Christian made Juliana more Jewish, in a way to which no true Christian could really object, and also made him more Christian, more attuned to the carnal nature of sacrifice. He never quite says that his bleeding son reminded him of Christ on the cross, but he does not need to. At his daughter’s bat mitzvah, she too becomes something of a sacrifice to God the Father, inasmuch as she has been sobbing because her father, as a Gentile, cannot stand with her as she reads Torah. The Sweeney/Wolls and the Renos have in common that each pair is simultaneously alike and different; within each couple, the content of their religiosity differs, but the quality of it, the way they believe, is quite similar. They disagree, but they know what they are disagreeing about. There are those rare families in which one member is, or becomes, quite serious about religion while the other remains indifferent, or perhaps scornful, or just bemused, or even supportive. But there are at least two other categories of interfaith couples, roughly speaking. There are those who are both equally indifferent to the religions they grew up in, who may have faint pangs of nostalgia or appreciation but are pretty comfortable existing as secular Americans, perhaps with a Christmas tree here, a relative’s Passover seder there. And then there are those far rarer families in which one member is, or becomes, quite serious about religion while the other remains indifferent, or perhaps scornful, or just bemused, or even supportive. The Renos know that they will have to reckon further with their theological differences, if not in this life then in the next. A more orthodox believer would say that while there may be two ways of seeing God, ultimately only one way can be correct. The Renos, for example, know that they will have to reckon further with their theological differences, if not in this life then in the next. CORRECTION, Aug. 28: Jon Sweeney is the grandson of two evangelical Protestant pastors, not the son of an evangelical pastor, as originally reported. It's interesting reading this article in light of some of the research I have been doing recently on some of the earlier Church councils. The Third and Fourth Councils of Toledo, which both had the heavy involvement of St. Isidore of Seville, both mandated that the children of such mixed marriages be baptized, and severely frowned on mixed marriages generally. Worth remembering that separation and segregation between faith traditions was considered a desirable thing for many centuries, often on all sides. Liberal tolerance of such things is a relatively recent thing, less than 200 years old in most cases. This Polish American cradle Catholic from OH married a nice Jewish boy from NY 37 years ago this month and have been very happy ever since, in spite of initial resistance from my parents and reactions from other Catholics and Jews . His family loved me, and my parents eventually came around. As the article points out, it depends on the couple and their flavors of faith. My husband was raised in a very secular household in which his parents rarely went to a temple or celebrated the holidays. I was educated in RC and also public schools with lots of Catholics. In college I met lots of Jews, dated Jewish men, and liked them as a group a lot. I met my soulmate when we were Army officers stationed in Germany. We later had two daughters we raised in the church. Although a practicing Catholic, I decided they should also know about Judaism at least culturally, plus I enjoy cooking, so I hosted family events like seders and Rosh Hashanah dinners. Occasionally they went to temple with their Jewish grandparents who celebrated first communions and confirmations with us. My husband never had any interest in becoming an observant Jew or converting to Catholicism or any other form of Christianity. He supported the religious instruction of our daughters and attended watershed events at our parish like his parents. The older daughter, who seriously considered conversion to Judaism and went on a Birthright trip to Israel, came back to the church later when she began to practice law. My girl saw what the church did for the poor and dispossessed, and decided that she wanted a RC education for any future children. She and her husband, a Protestant who attended RC schools, are raising their sons in the church. The younger girl, who graduated from an RC high school and a UMC college with lots of RC students, is attending religious instructions at a reform temple and definitely thinks she will convert to Judaism. Go figure! We are all OK with each other, because we love each other, differences and all... In the end, that's the most important thing--- that we love God and each other. This article had great meaning for me personally, as well as spiritually. In December, 2017 I will celebrate 50 years of marriage to my Methodist Christian wife. As a young man, my Catholic pastor passionately tried to dissuade me from proceeding with Cana instruction. I suspect most Catholics, and certainly priests consider me excommunicated because of my views in senior years. The fact is I respect my wife's upbringing, including family and church life. To complicate matters, my career as a musician, teacher, performer allowed me to direct choirs in seven Protestant, one Jewish and eight Catholic places of worship. I respect and love all of these people. I don't look at them with the suspicion I was taught in my parochial schools from K through University grad. My placement in a family tradition, race, ethnicity, corner of the world is ordered by God, just as it was for my Protestant wife. Although I respect my Catholic faith, I am not convinced the people I've encountered in different faith backgrounds have any less of a chance for salvation. I respect your view if you disagree, but it works for our 50 years of marriage. This article also appeared in print, under the headline "When a Jew and a Catholic Marry," in the September 4, 2017 issue. Mark Oppenheimer hosts the podcast “Unorthodox,” a weekly, irreverent look at Jewish news and culture. He holds a Ph.D. from Yale and contributes regularly to The Los Angeles Times and the The New York Times Magazine.